May I welcome you to the Chair, Madam Deputy Speaker? I congratulate the hon.Member for Warrington South (David Mowat) and other Members who have made maiden speeches this afternoon. I am grateful for the opportunity to make my second maiden speech, which might sound like a contradiction in terms. I can say one thing with certainty: I do not intend to make a third. I am delighted to represent Leyton and Wanstead in the House, having represented Hornchurch for eight years until the last election but one. Leyton and Wanstead which, like Hornchurch, is in east London, is a great place. I shall observe the traditions of the House by paying tribute both to my predecessor and to my constituency. Harry Cohen built a reputation over many years as an assiduous and hard-working constituency MP. He championed certain causes over many years, including Tibet, for which he fought-although I do not mean physically. He represented Tibet in the House, and he was a leading light in the all-party Tibet group, which I joined this morning. He fought, too, for asylum seekers-some of the most persecuted and vulnerable people in the world, and he did a great job on that. He led the campaign to save Whipps Cross hospital in the constituency, which was under threat of closure from the Tories for many years, but whose future was secured under the Labour Government. Whether it will be secure from now on remains to be seen. Leyton and Wanstead is one of the most diverse communities in Britain, with a huge range of religions, races, languages, beliefs, persuasions and outlooks. Across all those communities there is a high level of tolerance. People with widely divergent views and backgrounds can live together in harmony most of the time-recently, in fact, all the time-which is one reason why I like it so much. There have been one or two notable MPs for Leyton and Wanstead. Winston Churchill was MP for the old Wanstead and Woodford seat to the north of the constituency, until he retired in 1964. In the 1960s and '70s, Patrick Gordon Walker was the MP. He fought an infamous by-election after he had lost his seat unexpectedly in the 1964 general election. 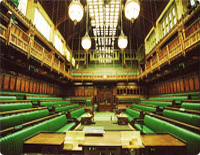 A vacancy was created in the old Leyton seat by putting the sitting MP, Reg Sorensen, into the House of Lords, so that he could fight it at the election, but he lost the seat. He regained it at the next election, but for a short time he was the unelected Foreign Secretary in Harold Wilson's first Government. These days it is unimaginable to think that somebody who was unelected could hold such high office, but there we go.